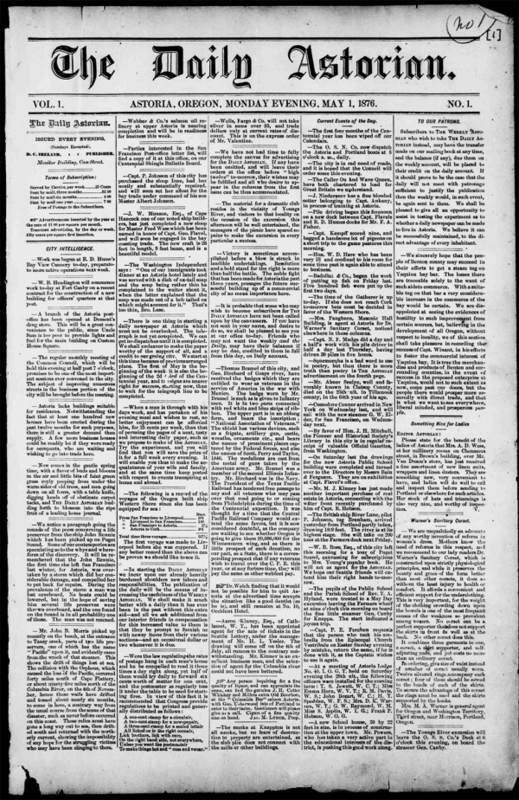 The first daily paper in Astoria, Oregon was issued on May 1, 1876 (well, daily other than on Sundays). The Astoria Daily Astorian‘s publisher, DeWitt Clinton Ireland, had started the Tri-Weekly Astorian three years earlier and was encouraged by the paper’s moderate success as the Astoria economy boomed with salmon and lumber exports. The paper’s motto was Impartiality, ability, fairness, reliability. A paper for the commercial man, for the farmer, for the mechanic, for the merchant, for every person. Shipping news and classifieds were prominently featured. Alas, the daily run lasted only until June 19, 1876, at which time the paper went to a weekly publishing schedule.